We have unveiled many firsts on brand-new games coming to the arcade industry – H2Overdrive, Justice League: Heroes United, Sega Rally 3, Sonic & Sega All-Stars Racing Arcade, Terminator Salvation, and many others. So I’m glad to once again present to you the next cool game you will be able to enjoy later this year at a venue near you. I actually meant to post this yesterday but I was sidetracked, so here it is today instead. This year marks the 10th anniversary of the brief TV show Firefly. Despite it’s short life-span on the small screen, it became something of a cult hit and there was a movie called Serenity that came out back in 2006. Now ten years after the show came and went, it returns to the small screen as players will get a chance to jump into the roles of Mal Reynolds, Zoe Washburne, or Jayne Cobb as they partake in another adventure, albeit one that involves plenty of shooting and explosions. -Support for 1-3 players, simultaneously. There is no friendly fire and the characters will just stick to the same axis as the player can move them side-to-side. If targeting reticules of two or more players are matched it adds a damage multiplier to the shots. The joystick design hearkens back to the Midway era, but they have been enhanced with internal LED lighting and force-feedback, the latter of which is uncommon in joystick arcade games. -Original voice work by actors Nathan Fillion, Gina Torres and Adam Baldwin. How much voice acting they have provided wasn’t mentioned but it’s a fitting touch. 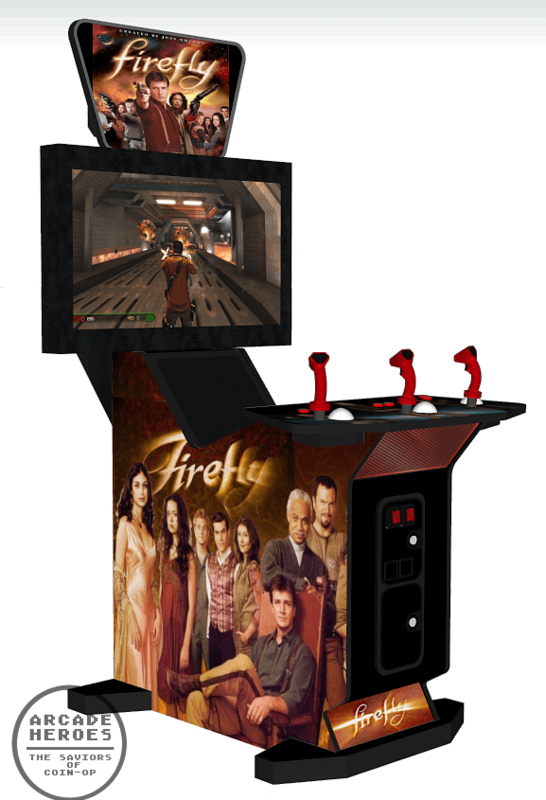 -Unique smartphone functionality that allows smartphone users who are standing by to selectively insert power-ups or enemies into the game during play, by using the Firefly Arcade App which can be downloaded to the phone for free from the cabinet. I imagine that this functionality has branched out of GVRs Mobile App development. It also facilitates statistic and location tracking as well as social media connectivity with Twitter and Facebook. This is the first arcade game I have ever heard of that makes such in-depth use of a smartphone. -In a first for arcades, the game will utilize 42″ 1200p screen (1920×1200 screen resolution which is most common with PC monitors) and maintains a solid 60 FPS frame rate. That is no small feat and shows that the game is packing some serious hardware to make it happen with all of the objects that will also be on-screen with these settings. As can be expected with this type of game, there is plenty to shoot and destroy as players face off against Alliance troops, Reavers and general bad guys they encounter. Screenshots and video of the game in action are soon forthcoming, for now all we have is the rendering of the prototype cabinet seen above. This of course means that it is subject to change. All-in-all, they are looking to pack quite a punch with this game, something that will become quite a piece in any arcade or gameroom for years to come. In the meantime while we wait to find out more about it this coming week, I have added the game to our upcoming arcade games release list. Also if you want to bug your local arcade into getting one, check out the links on that page. So a show hardly anyone watched will get a game placed somewhere hardly anyone visits? NICE! I’ll have to see if any of the few arcades out here will carry this. The game console is almost the shape of Serenity. Alright guys, if this is an April Fools joke, it’s just mean. I *wish* this existed. But – yeah, obvious April Fool’s is obvious. Evil, evil April Fool…. but did make me chuckle. I’m not so sure it’s an April Fool… It was posted yesterday – March 31 – not today – April 1. Actually that begs the question – how much is a Border Break? Thanks, jerk. I had my posting privileges at NeoGAF revoked until tonight because I fell for this. I hope you’re happy. On a more serious note, I’ve never seen a forum so ban happy for the stupidest offense as NeoGAF. Seems like they really need to relax once in a while, that or ban themselves for thinking the wrong gaming thoughts on occasion. They explicitly warned against posting obviously fake news on April Fools Day. You posted this the day before and it looked legit. I’m sorry but I don’t follow NeoGAF and their various warnings. If you were permanently banned then I would be happy to do what I can to get you reinstated unless they are so uptight that reason escapes them. It wasn’t my purpose to cause anyone actual trouble over this but it was made to be a joke.